We begin with Man City looking to respond to a rare defeat at home to Everton at lunchtime on Saturday. 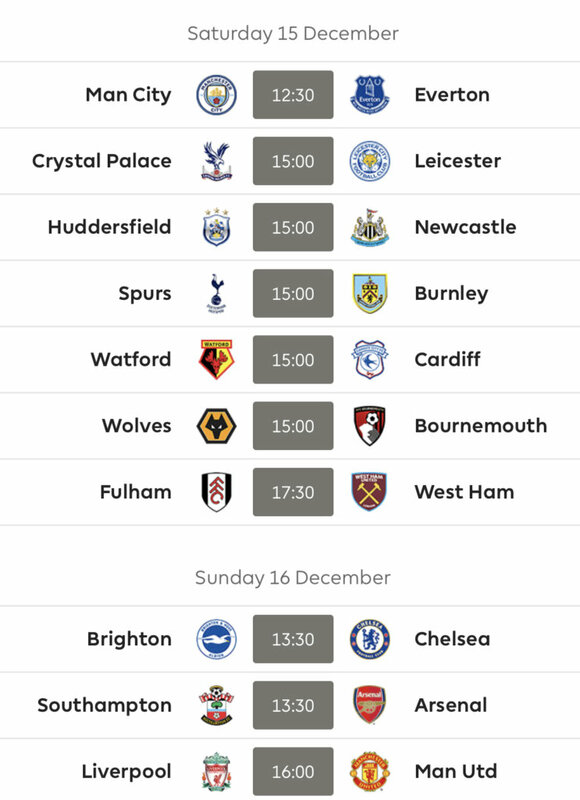 This is followed by five 3pm games; Palace look for a rare home win against Leicester, Huddersfield vs Newcastle promises to be a thriller *sighs, Spurs will be hoping Burnley haven’t quite found the eye of the tiger just yet, whilst Watford and Wolves will both be hoping to return to their early season form against Cardiff and Bournemouth. Fulham will look to bounce back after their embarrassing Old Trafford mauling against a resurgent West Ham in the Saturday evening game. 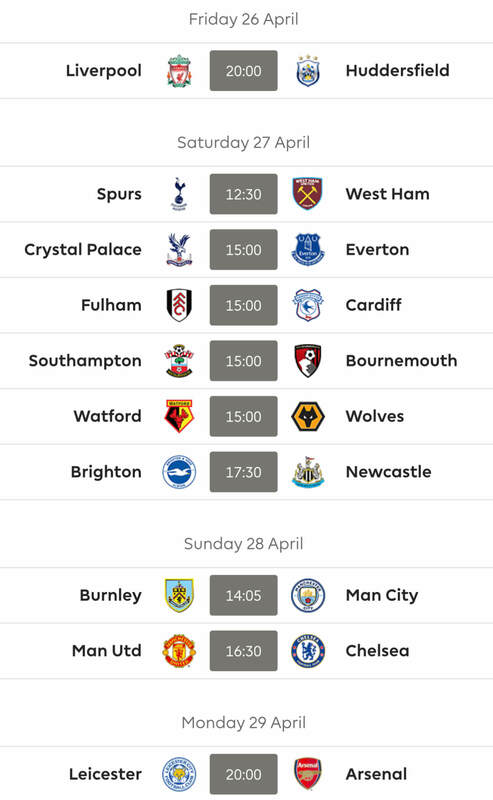 Sunday begins with two games at 1.30pm with Brighton hosting Chelsea and Saints welcoming Arsenal before our gameweek ends at 4pm with Liverpool’s annual Cup Final that is Man United. 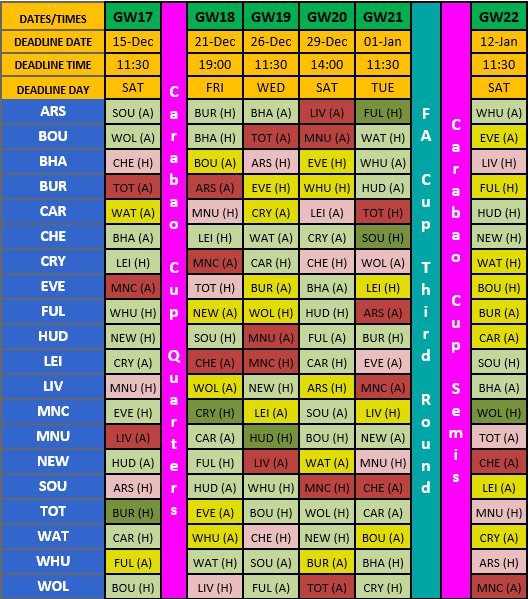 Good luck to absolutely everyone for Gameweek 17 from all at FF247! 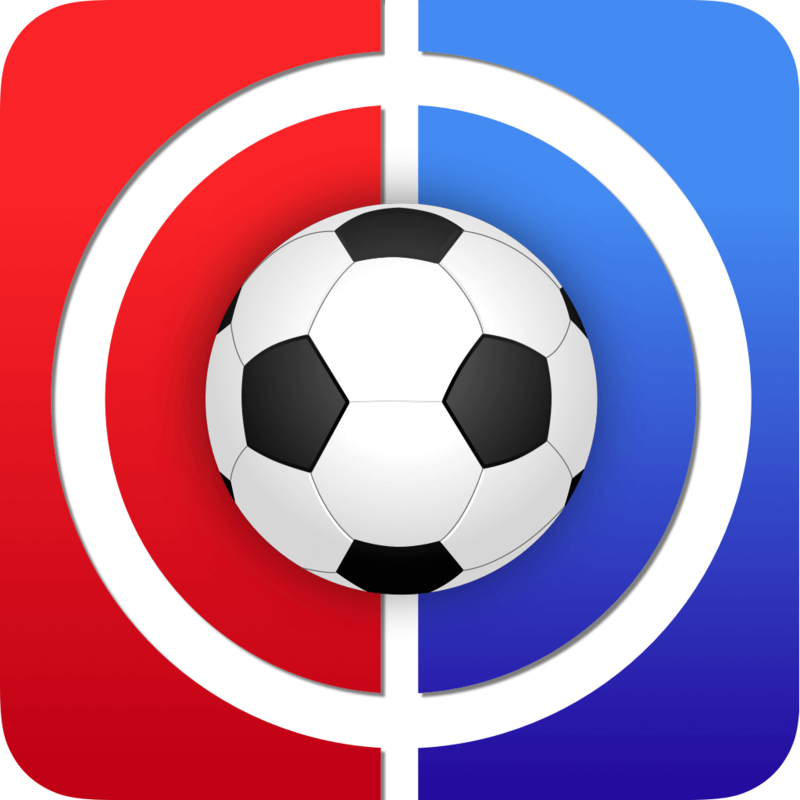 Thanks for reading Fantasy Football Live Match Chat Gameweek 17. Evening all. A nice green arrow to take me back to roughly where I was before my WC last week, which saw a big red! I’m suffering Arsenal regret. Subject to nothing else arising, does Laca half-a-game & Bellend to Firmino & Luiz make sense? Not seeing a great deal from Firmino that would make me want to rush out and buy him in all honesty. Much better week. The only thing missing was captain Kane and Aubameyang not producing. But what’s pleasing is the team are getting points on a whole while most of my rivals in my league are getting saved by 1 captain. If my captain choices start clicking I might shoot up the table :(. Now I have a headache, hazard is looking good(but Chelsea are kind of hot and cold despite kind fixtures) but sterling is doing okay despite rotation risk. Got 2 free transfers but enderson surely has to go now(waste of cash and not getting clean sheets anymore) and Ryan too(no clean sheets)not producing. With funds at already 1.4mil I could get like at least 1.5mil more.